- Contracts signed with legal and individual persons. According to the Law of Ukraine "On Legal Status of Foreigners and Stateless Persons" of 22.09.2011 № 3773-YI, Law of Ukraine "On education" of 07.01.2014 № 1556-YII, Order of the Ministry of Education of Ukraine from 01.11.2013 № 1541 "The procedure of applying and training (internship) of foreigners and stateless persons, the Law of Ukraine "On Foreign Ukrainian" of 04.03.2004 № 1582-IV, CMU Resolution of 28.03.2012 № 251 "On approval of the design, preparation and issuance permission for a permanent and temporary residence and technical description of its forms’’, CMU Resolution of 27.08.2010 N 796 "On approving the list of paid services that may be provided by educational institutions, other institutions and educational institutions that belong to the state and municipal property"; "Procedure of providing paid educational services by state and municipal educational institutions", approved by the Ministry of Education of Ukraine, Ministry of Finance of Ukraine, Ministry of Economy of Ukraine of 23.07.2010 № 736/902/758, CMU Resolution of 13.03.2013 № 185 "On the Unified State Register of demographic and documents proving citizenship of Ukraine, verifying identity or its special status". Foreigners who get state scholarships according to international agreements, national programs and other international obligations of Ukraine, shall be admitted on the basis of Ministry of Education and Science within the scope of the government order. Foreigners Ukrainian descent, who received training from the direction of Ukrainian national and cultural societies, entry into higher education in Ukraine in the areas of industry knowledge "teacher education", "art", "humanities", "journalism and information", "social and political science", have the same rights to education as the Ukrainian citizens, including when entering the training of public order (order of the Ministry of Education of Ukraine from 18.09.2009, № 8773). They take part in the competition for admission on the same basis as Ukrainian citizens. When entering other areas of training (specialty) foreigners of Ukrainian origin, who received training from the direction of Ukrainian national and cultural societies, have the same rights to education as citizens of Ukraine, if they participated in international competition with general subjects, entrance exam of which is defined as a profile for the University of entering of the chosen direction of training (specialty). Foreigners and stateless persons permanently residing in Ukraine and have been grantedrefugee status in Ukraine shall be accepted to universities in the manner provided for the citizens of Ukraine. Foreigners, who have received secondary education in foreign schools with Ukrainian languageare accepted to the University for admission test under these rules of admission, within the establishedquotas on the recommendations of national cultural societies and Ukrainian diplomatic missions of Ukraine abroad. Foreign citizens and stateless persons who do not fall under the above Rules shall be credited to study in higher educational institutions of the interview and on the basis of contract. To be admitted to the higher educational institution an international student should have secondary education certificate and satisfactory health state for habitation in climatic conditions of Ukraine and training in chosen specialty. Foreign citizens who graduated from the higher educational institutions of foreign countries are entitled to continue the education in Ukraine on the basis of the documents that certify their education level. To be admitted to postgraduate education program an international student should have higher education diploma and capability of conducting research. Those who apply to postgraduate programs have to submit the list of publications, including the name of publisher, certified by the head of the institution, institution or organization in the workplace. Students who have no publications have to submit scientific reports in their chosen specialty. - copy of the award of the degree of Candidate of Sciences (Ph.D. diploma). The documents in sub-item 4-7 should be certified in accordance with the legislation of the issuing country, translated into Ukrainian and notarized. The documents can be sent to post address of NULES of Ukraine twice a year: from July 3 to October 16 and from February 1 to February 20. Interviews are held from July 4 to October 23 and from February 2 to February 22 accordingly. Admission to training is carried out from July 4 to November 1 and from February 2 to March 1. - original invitation to education, issued by the University. While crossing the Ukraine’s border, CIS citizens (if no visa required) should state “education” in “the purpose of visit” line of a migration card. This card must be registered with border passport control. Attention! 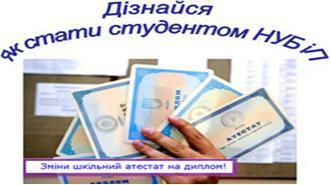 The same documents candidate provides at the line of Ukrainian border crossing and on arrival at the University. Citizens of visa-free entry regime with Ukraine in completing the migration card at the port of entry in the "Purpose of entry to Ukraine" must provide "training". This card must be registered with the State Border Service. The card with the passport is provided to the University for registration after enrollment.Candidate for education has to inform about his/her arrival to university no later than in 3 days period and provides university with the date of his/her entry to Ukraine and the flight (or train) number. *Several subjects of specialties "Veterinary Medicine", "Ecology and environmental protection", "Ecology and Environmental protection", "Plant Protection", "Ecology, environmental protection and balnced environmental , "Agronomy", "Plant protection", "Administrative management", "Management of Foreign-economic Activity", "Accounting", "Finance" are taught in English. The cost of the preparatory department for foreign students - $1200 per year (paid in UAH according to NBU exchange rate on the day of transaction). The cost of additional organizational and protocol-information and advisory services * - 3500 UAH. * - For more information please contact the Center for International Activity (3 building, 107 audience). Tel . : +38 (044) 258-42-34. - Candidate of science — 4 years (in the presence of master diploma). The course starts on September 1. Foreign students have access to library collections of the National University of Life andEnvironmental Sciences of Ukraine (http://elibrary.nubip.edu.ua), in particular, the Scientific LibraryNUBiP Ukraine (National Depository Library FAO http://library.nauu.kiev.ua/index.html). Every year NUBiP Ukraine organizes international festival of art "Holosiivska Vesna". Also, foreign students can submit the traditions and culture of his land in such events as "Student evenings." The university town is situated in the picturesque place of the capital of Ukraine, Kyiv. Students live in the students' hostels. The price of living in the hostel is 650 UAH per month. Cost of accommodation should be paid extra. For information, contact the Center for international Activity (building 3, room 107).